In the life of an iPhone, there is a time when you may have to erase all the stored items on your phone. Erasing your iPhone is a scary process because you will lose all the saved pictures, music, videos and other files with no way to retrieve them except if you have made a backup. There are some situations when you would want to erase your iPhone to delete email addresses, passwords and business-related information. 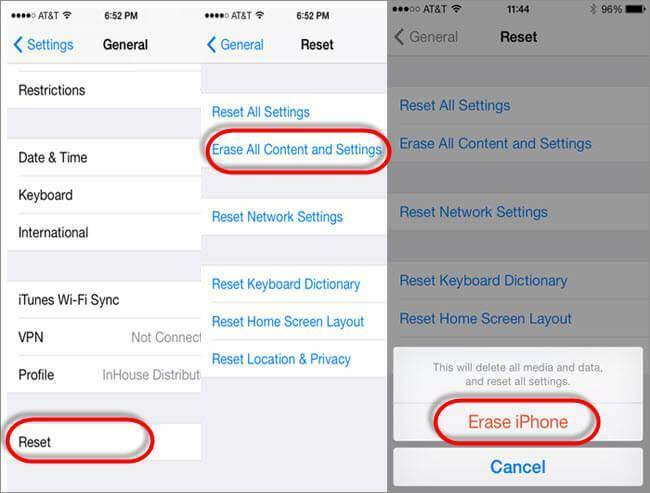 Below are the ways to erase iPhones without iTunes. 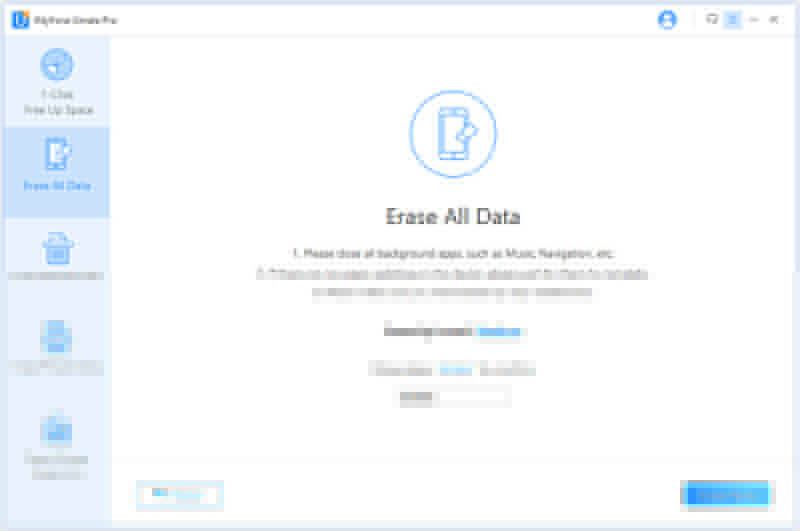 iMyFone Umate Pro for Win is well secured and undetectable data eraser tool for iPhone. 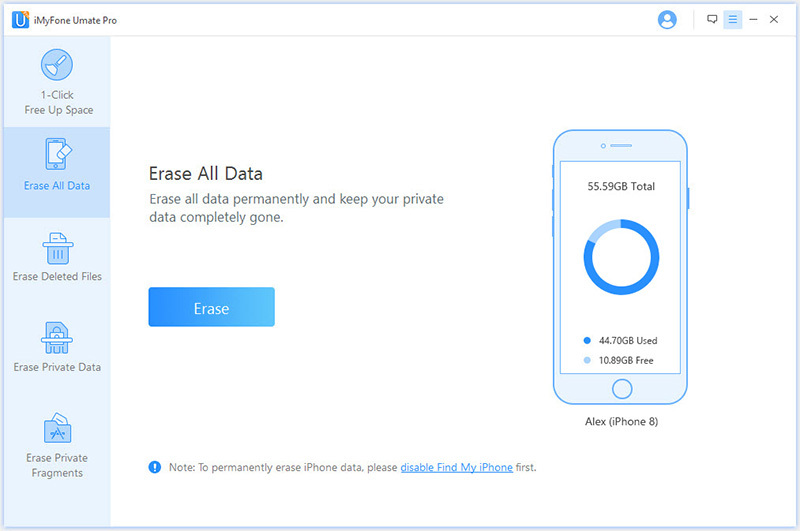 The device enables iPhone users to check and view files you wish to erase before you continue, thus making sure that you permanently delete the files that you want to wipe completely. The iMyFone Umate pro can be used to factory reset iPhone without iTunes. Permanently erase existing files, making them 100% unrecoverable. Selectively delete files and data like call records, pictures, video, text messages, third-party app data etc. Completely remove fragments of files left behind by third-party services and application. Free options to clean junk files, caches and logs. Highly recommended by many online media like MacWorld and iPhoneinCanada. Step 1: Firstly, Download and open the iMyFone Umate Pro app. connect your iPhone to your PC using a USB cable. Step 2: Then, select the “Erase All Data" option and select the “Erase” button. You will have to select the “delete” option on your window. Step 3: To validate the delete option, you need to insert “Delete” in the security box. You can change your security confirmation answer in the security level settings. Step 4: When you insert the “delete” option in the box, click on the “Erase Now” button, your files will be deleted entirely. Note: Don’t forget that files that are erased using this method cannot be recovered. Hard reset is a process of deleting iPhone back to its default state when produced from the manufacturer’s factory. Also, some reasons can prompt you to hard reset your iPhone. You may want to clean your phone and return it to its normal state due to some unfortunate performance problem that may occur after using your phone for a long time. Hard reset is one of the useful methods to factory reset iPhone without iTunes. You can follow the steps on how to erase iPhones without iTunes:Step 1: Firstly, connect your iPhone to a computer. 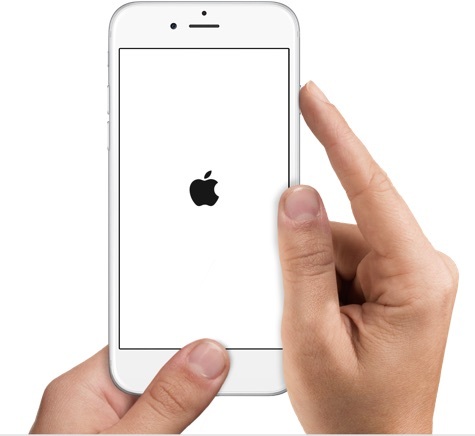 Step 2: When your device is connected, for iPhone 8 and 8 plus, press and release the Up volume button on the iPhone. Repeat the process for the down volume button; hold the side buttons still the recovery mode screen display on your screen. For iPhone 7 and 7 plus, press and hold the down volume button and the side simultaneously until the recovery mode screen display. For iPhone 6s, Press and hold the side and Home buttons simultaneously until the recovery mode screen display. Step 3: You can select the “Restore” button from the recovery mode screen. Step 4: Finally, configure your iPhone when the update is complete. Erasing files on iPhone X is a little bit difficult. However, you can follow these steps below to hard reset your iPhone X without iTunes. Step 1: Press and quickly release the Up volume button. Step 2: You can repeat the process in step 1 for the down volume button. Step 3: Then, press and quickly hold the side button (Sleep/Wake button), you must not release the button unless the Apple symbol display. Step 4: Finally, you can attempt to reset the iPhone settings. Step 1: Go to the settings on your iPhone and Click on the general setting. Step 2: Scroll down to the “General settings” and click on “Reset”. Step 3: Select “Erase” option on the settings. Step 4: To validate this process, you will be required to provide your iPhone password. Click on “Erase iPhone” to complete the reset. It is simple to factory reset iPhone using Find My iPhone feature on iCloud. If Find My iPhone is enabled on your iPhone, it can be erased with iCloud. Step 1: Open your web browser and search for iCloud (www.iCloud.com). Step 2: Ensure you sign in with your Apple ID. Step 3: Select Find My iPhone. Step 5: Select the iPhone you want to erase. Step 6: Click on "Erase iPhone" button.